Encanto Vista was part of a 320-acre tract of agricultural land purchased by Phoenix merchant James W. Dorris just after the turn of the 20th century. Dorris built his home on the tract which was then outside the city limits. His house on N. 7th Avenue still survives. As the city grew out to meet him, Dorris sold different parcels for residential development. 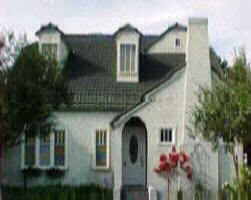 Among them were the prestigious Encanto Palmcroft and Encanto subdivisions to the south of Encanto Vista. In 1943, Dorris sold most of his remaining property to the Hamman Lumber Company with the caveat that they build a high class development, a condition that he had placed on his earlier ventures (Weight, March 3, 2003). By insisting on restrictive covenants and minimum lot prices, Dorris virtually guaranteed that these subdivisions would attract only well-to-do residents. Since his own home lay immediately north of Encanto Vista, he also ensured that his neighbors would be of his social and economic class. Dorris's measures laid the groundwork for Encanto Vista as a Picturesque Neighborhood (1911-1955) whose appeal lay in its exclusivity and aesthetic qualities. When the Hamman Lumber Company filed a plat for Encanto Vista in 1943, they knew they wouldn't be able to build until after the war due to restrictions on "non-essential" housing. Nevertheless, the property was an attractive tract that promised success in the postwar period. To the south lay the upscale Palmcroft and Encanto subdivisions and to the west lay Encanto Park, a city park acquired from Dorris in 1937. The 100-acre Encanto Park featured an island lagoon, lush vegetation, a clubhouse, and two golf courses (Weight, March 3, 2003), one of which bordered the Encanto Vista site. The high tone of the Encanto neighborhood and the park amenities would prove enticing to home buyers. A Picturesque Neighborhood in the tradition of Encanto Manor, Los Olivos, and Encanto-Palmcroft,, Encanto Vista was well-planned to benefit from the attractive green space of Encanto Golf Course/span>. Streets were designed in an unusual repeating horseshoe pattern to provide views to the greatest number of residents, achieving a park-like setting for its custom and semi-custom homes. Houses and lots were large; houses averaged 1,900 square feet and lots averaged one-fifth of an acre. A sense of cohesiveness was achieved through standard sized houses and lots and setbacks of 30 feet. Unity was further gained by the use of similar building materials such as brick, block, asphalt shingles, and casement windows (Weight, March 3, 2003). In contrast, many different architects and builders contributed to Encanto Vista's housing stock, adding variety to the predominant Ranch style. They included glass block, bullseye windows, varied wall patterns, bay and corner casement windows to create variety and texture in an otherwise uniform setting. Development in Encanto Vista represents the transition between pre-war construction trends, in which many different contractors built individual homes for specific clients, and later postwar patterns, in which developers built large tracts of similarly designed houses on speculation. Following pre-war tradition, many different builders and architects contributed to Encanto Vista's development, a fact that resulted in a variety of design motifs and materials. On the other hand, the district embraced new concepts in subdivision development and was laid out on similarly sized and shaped lots with one-story masonry houses. Though individual houses possessed unique attributes, nearly all were variations on the modern Ranch style. Also, like many of the new postwar neighborhoods, nearly one-fourth of Encanto Vista's homes were built on speculation. 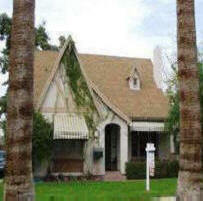 Encanto Vista differed in other ways from the typical postwar home in Phoenix. House lots in Encanto Vista are generous, averaging approximately one-fifth of an acre and measuring about 65 feet wide by 130 feet deep. Large lots accommodated significantly larger houses than the average postwar tract home. The average house size in the neighborhood is 1,900 square feet compared with only 1,250 square feet for the average single family house in Phoenix at the time. And, it was much larger than the typical single-family home built in the United States which averaged less than 1,000 square feet. Also, the average post-war house in Phoenix had five rooms and one bathroom while the typical Encanto Vista house had six rooms and two bathrooms. Additionally, more than two-thirds of houses in Encanto Vista had a garage at the time of construction compared with only twenty percent of houses throughout Phoenix. All of these factors further illustrate Encanto Vista's upscale characteristics. Both pre-war and postwar subdivisions touted amenities to attract buyers. In the early 20th century, developers advertised streetcar access, city utilities and lack of city taxes to draw potential home owners. In the postwar period, developers enticed potential buyers with access to schools, hospitals, and shopping centers. A major selling point for Encanto Vista was its location near a major public park and golf course. 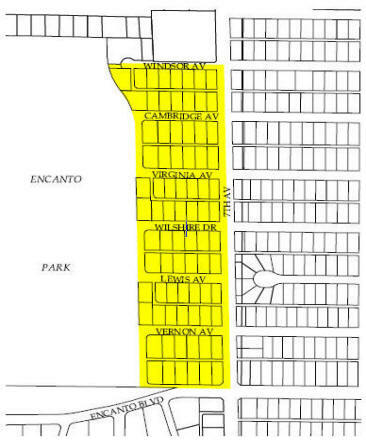 Encanto Vista's streets, with their east-west horseshoe plan, were laid out to allow views of the golf course. No house was more than a block from the green space and one real estate agent advertised a house in the subdivision as being only half a block to the eighth tee of the Encanto Golf Course. Nearby Encanto Park was also a selling point to young families with children. After the austerity of the Great Depression and the war years, many would-be householders longed for a new start and eschewed older used homes and neighborhoods. Encanto Vista offered a fresh, new neighborhood with modern houses built in the fashionable Ranch style. Houses in the Encanto Vista Historic District are all variations on the Ranch style which dominated residential design after World War II. 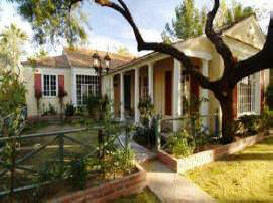 Encanto Vista's Ranch style houses are all one story, a hallmark of the design. Most feature hipped roofs and steel casement windows. Virtually all of the district's houses are masonry with more than two-thirds rendered in brick with the rest constructed of painted or stuccoed block. Variations on the Ranch style found in the district include French Provincial, as typified by the Clarence Crittenden House at 718 West Cambridge, International Style as found in the Howard Boice House at 727 West Windsor Avenue, and the Early Ranch, like the Shaw House at 706 West Virginia Avenue. Brick patterns and tile roof ridge caps are common ornamental features found in Encanto Vista. When developers planned Encanto Vista, they zeroed in on a key selling point for the neighborhood: Encanto Golf Course. Decades later, that amenity is still a favorite among some residents. Encanto Vista is among the smaller historical neighborhoods in Phoenix, with about 80 homes shoehorned between Seventh Avenue and the golf course. When original landowner James W. Dorris sold the property in 1943, he decreed that the new owner build only a "high-class development," city records show. Indeed, the neighborhood's large lots and homes immediately attracted a Phoenix mayor, prominent architects, business leaders and others.